Classic Industries offers a wide selection of Custom and Specialty Emblems & Decals for your Chevrolet Chevy II Nova. 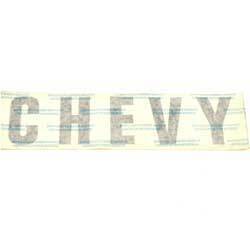 Classic Industries offers Chevrolet Chevy II Nova Bumper Stickers and Chevrolet Chevy II Nova Novelty Decals. Look But Please Don'T Touch Magnetic Sign - 5-1/4" X 3"
Make sure people know to "Look but don't touch" with this small but effective magnet.